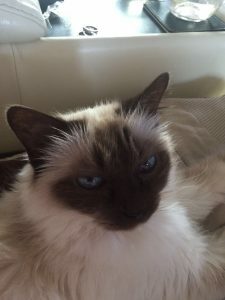 During one of my recent extended cat sits I was privileged to have the opportunity to use Reiki on one of the cats called Carrie, who lives with two other cats. Sadly the fourth cat Shaun, had recently passed away very unexpectedly at a young age. Carrie and Shaun had been the best of pals and she was definitely grieving for him. As a qualified Reiki practioner I already knew how beneficial it could be for my human clients on both an emotional and physical level. On my previous visits I had always been greeted by Shaun and Carrie as I entered the property, both vying for my attention. After sorting their food and litter trays Carrie would plonk herself on my lap and enjoy cuddle time, Shaun would want me to play and the other two girls always wanted to be groomed! This time however I found Carrie upstairs in her basket cuddled up to Livvy and looking forlorn each time I visited for the first five days. She did not move and I couldn’t persuade her to come for a cuddle. I mentioned this to her owner during one of my daily texts. Jan told me that she had not been herself since Shaun had gone and really seemed to be missing him. On day 6 I sat on the floor next to the basket containing Carrie and Livvy. I talked to Carrie and gently lifted her onto my lap and then asked the Reiki to flow. She seemed to enjoy the healing energy and after about ten minutes she climbed back into her basket and snuggled up to Livvy. The next day I was pleasantly surprised when Carrie climbed onto my lap purring contentedly. As the days went by Carrie became more and more vocal and demanded her daily cuddles as in previous cat sits! It was lovely to see her so much happier. On Jan’s return I explained what had occurred and she was pleased that Carrie seemed much more like her old self! Several weeks later Jan messaged to ask if I had also done Reiki on Livvy. I explained that I had not done it intentionally, but as Livvy had been in the basket next to me she would have benefitted from the healing energy in the room. I enquired if everything was alright with Livvy and was so pleased with the reply I received. Jan was happy to add to this article. ‘Carrie has been distraught since Shaun left us. She cried and called every time she was awake and would pace the house. Since Nicky did some Reiki on her she is much calmer and a lot happier. The Reiki benefitted another of my cats who has colitis. She had daily accidents and would rarely interact with me. Since the Reiki on Carrie, there have been no accidents but also she comes to me nightly for attention and cuddles’. It is so good to hear that both Carrie and Livvy have benefitted from this amazing healing energy.